Jazz Jamm Takes Place Tomorrow! Hi Tampa Bay, Alex here to let you know about a concert taking place at The Patel Conservatory at David A. Straz, Jr. Center for the Performing Arts tomorrow! 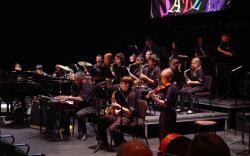 Jazz Jamm is taking place on Wednesday, May 9, at 7 p.m. in the TECO Theater. Students from the Patel Conservatory’s jazz classes will come together to perform in this jazz concert, under the direction of James W. Crumbly, Jr. Regularly priced tickets start at $12. Tickets may be purchased by calling 813.229.STAR (7827), in person at the Straz Center Ticket Office or online at www.strazcenter.org. The Patel Conservatory offers classes for children and adults of all experience levels in all kinds of dance, music and theater. More information about the Patel Conservatory is available by calling 813.222.1002 and by visiting www.patelconservatory.org.